PASSPORTS: Valid passport required by all. British passports must be valid for at least 6 months after returning from Georgia. Visa required by all except resident nationals of Bulgaria, Commonwealth of Independent States (CIS) and Poland for a period of up to 30 days. 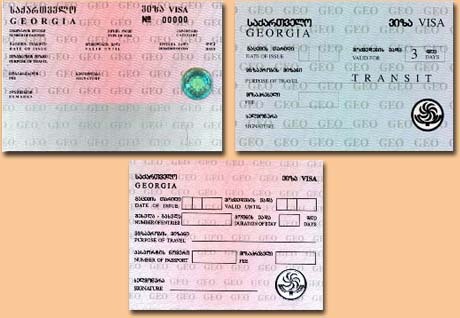 To receive an entry visa into Georgia aliens should apply with a declaration to a diplomatic representation of Georgia in a foreign country or a consular institution, or to a corresponding subdivision of the Ministry of Foreign Affairs. Georgian visas are given out and extended by consular institutions of Georgia in foreign countries and consular services existing on the territory of Georgia - the Consular Department of the Ministry of Foreign Affairs and its representations. Georgian visa is not imperative during accreditation to missions of foreign states accredited in Georgia, diplomatic, consular or equivalent institutions, trade representations, international intergovernmental organizations or employees of representations equivalent to them, - those who passed accreditation in the Ministry of Foreign Affairs. They enter and exit Georgia on the grounds of an accreditation card provided by the Ministry of Foreign Affairs. Categories of visa: Diplomatic, Business (issued for business or educational visits, trade fairs, conferences or exhibitions), Tourist, Transit. Types of visa: Single-, Double-, Multiple-Entry/Exit. Tourist: personal US$ 20; group, per person US$ 15. Single-Entry/Exit: under 2 weeks US$ 30; under 1 month US$ 40; under 3 months US$ 60. Multiple-Entry: under 6 months US$ 120; under 1 year US$ 180. Transit: single US$ 10; double US$ 15. Payments for extending a visa are equal to payments for issuing a corresponding visa. (b) 1 recent passport-size photo. (e) Hotel or flight booking. If staying with friends or family, a letter of invitation from the host. Note: For Business visa also need an introductory letter from company or firm indicating the purpose, itinerary, organization to be visited and period of stay supported by and invitation from the organization, department or institution to be visited in Georgia. All postal applications must be accompanied by a registered large stamped, self-addressed envelope. (a) Travelers with Transit visas are allowed a maximum of 3 days to transit, provided they are in possession of confirmed onward travel documentation and valid entry requirement for the onward destination. (b) Generally, all visas need proof of accommodation. (c) For visits to relatives/friends in Georgia, enquire at the Consulate (or Consular section at Embassy) for further details.